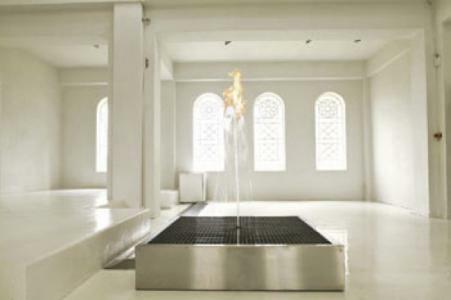 SCAI THE BATHHOUSE | Exhibitions | Past | Jeppe Hein "Inbetween"
Jeppe Hein was born in Denmark in 1974, and works from bases in Berlin and Copenhagen. For the past several years he has exhibited at art museums and galleries around the world, and has been in constant demand for international art exhibitions. Still an upcoming artist, the art world is keenly watching how his work develops. 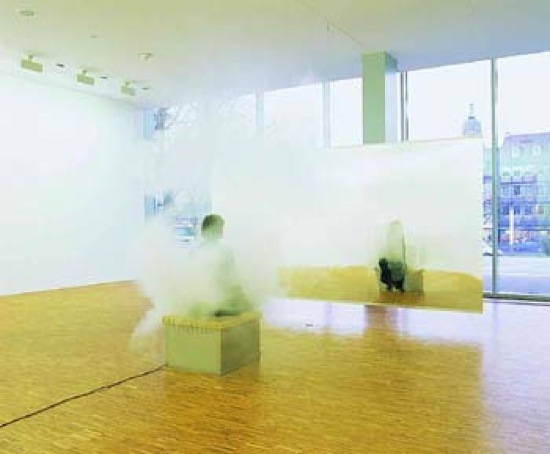 Jeppe Hein's works are humorous, drawing observers into newly-created physical and psychological experiences. 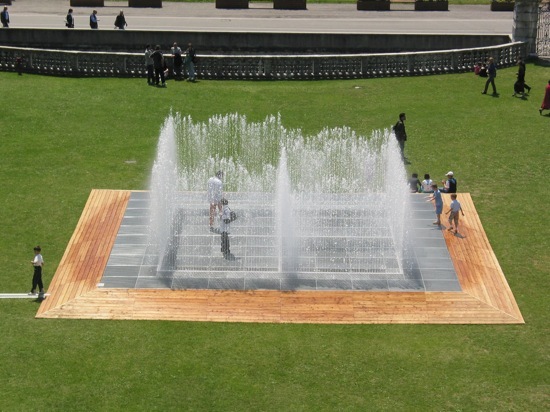 In 2003 he created a labyrinth from water jets at the Venice Biennale, with sensors that raised walls of water in response to the movement of someone entering, trapping them inside. 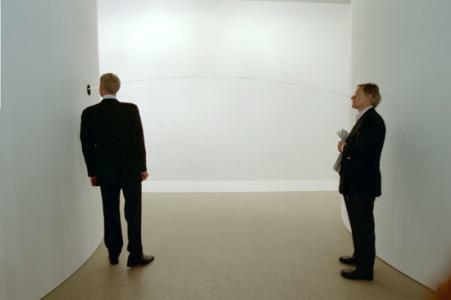 This large work attracted the most attention of any of the art at the Biennale. 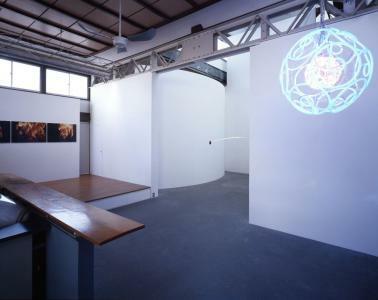 Another work is a large room with nothing in it. Visitors wear headsets that monitor the wearer's movement and vibrate unpleasantly when they detect movement in particular directions, thereby creating the walls of an invisible maze. Other works incorporate flames, such as the flames rising from the water spray in a fountain, or benches, such as a bench with clouds of vapor that billow out when someone sits down, enveloping the sitter. Hein's works undercut perceptual and cognitive logic, amusing us through stimulating tricks or mechanisms that take us by surprise. Hein frequently uses sensors to detect how people move, utilizing that movement to change the behavior of the work in unpredictable ways. 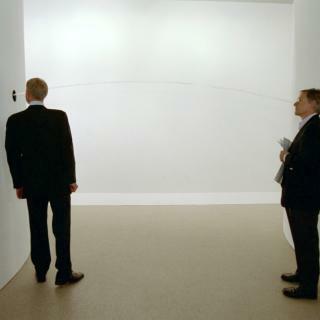 Visitors attempt to actively influence the work's behavior, but they find themselves having to accept that it cannot be completely controlled. That irrationality is part of what is amusing. With his rich sense of playfulness, Hein makes just little changes to the 'normal' form and function of a space/object/phenomenon, or to its interrelationship with observers, but in doing so he opens up a whole new world that the observer has not seen or experienced before, demonstrating the fragility and lack of certainty behind the order and the rules that our daily lives are dependent on. Hein's works initially seem to be innocent purveyors of wit, but on closer examination they are much deeper; full of pleasure and joy. Francesco Bonami, director of visual arts for the 50th Venice Biennale rated Hein's work very highly, setting it apart from simple interactive art that draws in visitors by describing it as "a sort of mental sculpture that has both a life of its own and a life shared with the viewer. It happens sometimes that the users of Hein's work don't even know what the work is about, actually they don't even realize it's a work of art." Bonami adds that "The power of Jeppe Hein's art is the capacity to hide into the context where it happens to operate"
The main piece in the solo exhibition at SCAI is his architectural installation, "Continuity Inbetween," in which two walls facing each other are joined by a line of water that jets between them. The effect is an uncanny sensation and a new experience. 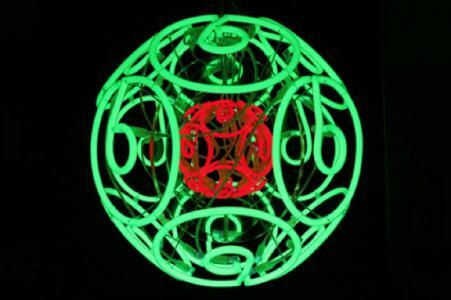 Hein will also be exhibiting new works in neon. This exhibition marks the start of a busy year for Jeppe Hein, with a schedule that includes exhibitions at the Tate Modern in London and the Sculpture Center in New York.